Monday kicked off with a bang as it was announced social network giant Facebook acquired social aggregating site FriendFeed. If you’re unfamiliar with FriendFeed, the free service allows users to add their activity from across the social web and aggregates the activity into one stream. You can follow other people’s streams, much like Twitter. You can also create custom groups to better follow those you care about. So what does this mean? 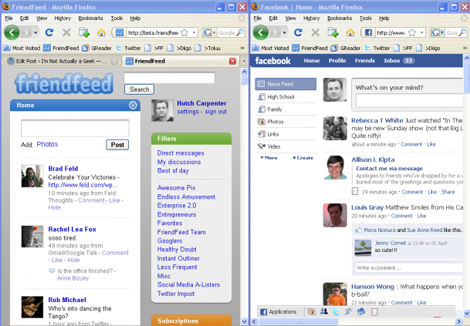 For one, FriendFeed had already influenced changes in Facebook. Likes, anyone? The importance of Facebook making this move is obvious; the stream is king. It will also solidify Facebook as a true center for user’s social activities- not just a place to see what friends are up to. You can check out my FriendFeed here.